Put belly skin side down and arrange loin in center. Roll belly around loin so the short ends of the belly meet. If any of the belly or loin overhangs, trim meat. Unroll; set loin aside. In a small skillet over medium heat, toast fennel seeds and red pepper flakes until fragrant, about 1 minute. Transfer to a small bowl; set aside and let cool. Once cooled, grind spices fennel seeds and pepper flakes in a spice mill or with a mortar and pestle. Transfer back to small bowl and add fennel pollen, rosemary, and garlic; set fennel mixture aside. Assemble porchetta according to steps 1-5 below. Refrigerate roast, uncovered, for 1-2 days to allow skin to dry; pat occasionally with paper towels. This will help create a nice crispy porchetta! 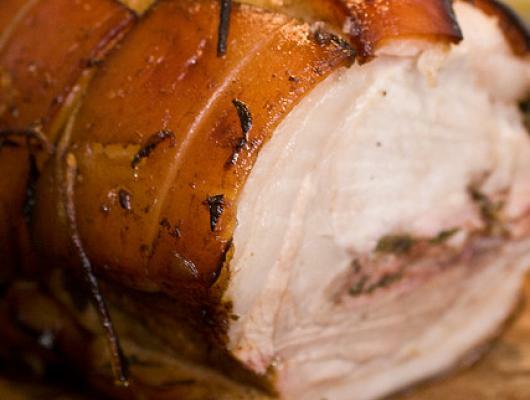 After 1-2 days, remove from refrigerator and let porchetta sit at room temperature for 2 hours. Season porchetta with salt. Roast on rack in baking sheet, turning once, for 40 minutes. Reduce heat to 300° and continue roasting, rotating the pan and turning porchetta occasionally, until an instant-read thermometer inserted into center of meat registers 145°, 1 1/2-2 hours more. If skin is not yet deep brown and crisp, increase heat to 500° and roast for 10 minutes more. Let rest for 30 minutes. Using a serrated knife, slice into 1/2" rounds. 1. Set belly skin side down. Using a knife, score the belly flesh in a checkerboard pattern 1/3" deep so roast will cook evenly. 2. Flip belly skin side up. Using a paring knife, poke dozens of 1/8"-deep holes through skin all over belly. 3. Using the jagged edge of a meat mallet, pound skin all over for 3 minutes to tenderize (this helps make the skin crispy when roasted!). 4. Turn belly and generously salt both it and the loin; rub both with fennel mixture. Arrange loin down middle of belly and top with orange slices. 5. Roll belly around the loin; tie crosswise with kitchen twine at 1/2" intervals. Trim twine. Transfer roast to a wire rack set in a rimmed baking sheet. Porchetta (pronounced porketta) is typical street food in Italy (sliced and served on bread), but it is found more and more on menus in restaurants. 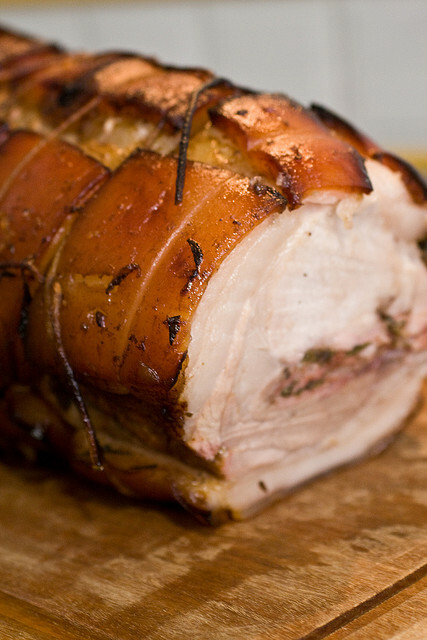 Porchetta - a roast consisting of loin wrapped within pork belly - takes time to prepare, but it is well worth the effort! Tenderizing the outer skin of the belly, then allowing the skin to air dry for about 24 hours results in a crispy, "crackling" outer layer. The inner fat of the belly keeps the loin moist and juicy. When the porchetta is sliced and served, you get a trifecta of flavors and textures: a crispy outer skin; an unctuous and fatty belly; and a succulent, juicy loin. In this preparation (based on recipes from both Bon Appetit and Saveur), we use the fragrant and very flavorful addition of fennel pollen. This potent herb should be used sparingly as it is potent, but the flavor is imparts is like no other! It can be difficult to find in stores, so we buy ours on Amazon (you can order here).